This is a quickie update on the new Zen garden. The land is fully terraformed and the bamboo forest is far along in it’s development. The garden area has the traditional Zen garden plus a Buddha. The new Harvest Moon Cafe has been built in, but I had to remove the tea house because I ran out of prims. There are several beautiful trees but so far, no grasses, plants or grasses. So I’ll declare the garden 90% complete, although the prim shortage may cause some redesign. Here are a coupe progress photos. Overhead view shows the garden compound upper left, the bamboo forest (almost everywhere) and the tea house on the little island (had to take it down). Here I am in my gardening clothes, standing at the landing spot in the middle of the garden/cafe compound. 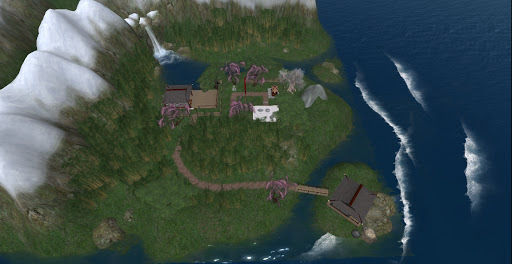 This entry was posted in Features and tagged Creating & Building, Photography, Second Life. Bookmark the permalink.